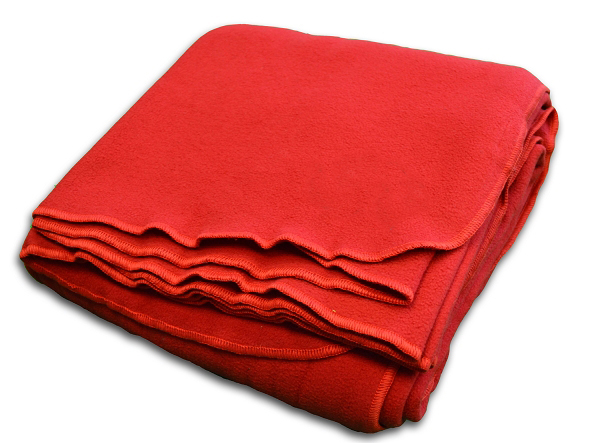 Enjoy this practice friendly, ever-so-soft Polyester Fleece Blanket from Yoga Accessories. Made from 100% polyester fleece, this yoga blanket makes an excellent, versatile yoga prop to support your body and poses in asana practice. It also comes in handy as a soft throw blanket outside the studio. Bright red color is visually-stunning and you will find. Anti-pill properties make this garment easy to clean. Finished with a matching whipstitch (we love this stitch because it enables us to fold blanket evenly. Because this is a Yoga Accessory product, you can expect affordable, wholesale prices -- great for furnishing any home or studio yoga space. Measures 60"W x 50" L; Weighs 12.7 oz. Beautiful blanket! It's lightweight and soft, perfect for yoga or curling up on the couch.